Audi is famous for their AWD and for hanging inline 5-cylinder engines over their front axles. A V10 isn’t much longer, and that’s just what today’s Nice Price or Crack Pipe S6 has hanging out under its hood. It has something else, which might just make you second guess hanging on. So much went unanswered in the ad for yesterday’s wild custom 1959 Lincoln Continental Mark IV Pickup, questions like; why was it created, was it originally a flower car, is it what Wolfman Jack drove to the Fixit Center for bags of Wolfmanure? On thing that did get answered however, was its price, and that answer, from 62% of you at least, was no freaking way. Volkswagen’s purchase of Lamborghini in 1998 has since been mutually beneficial for both the Italian marque and for Audi, whom VW imparted management of the company. Since the purchase both VW’s purse strings and their parts catalog have been made available to Lamborghini, imbuing the products of Sant’Agata with mechanical bits and interior pieces no longer sourced from the local Home Depot. It’s also meant that Audi could repurpose the Gallardo as the R8, and could re-engineer the Italian all-alloy V10 engine for use in their AWD sedans. 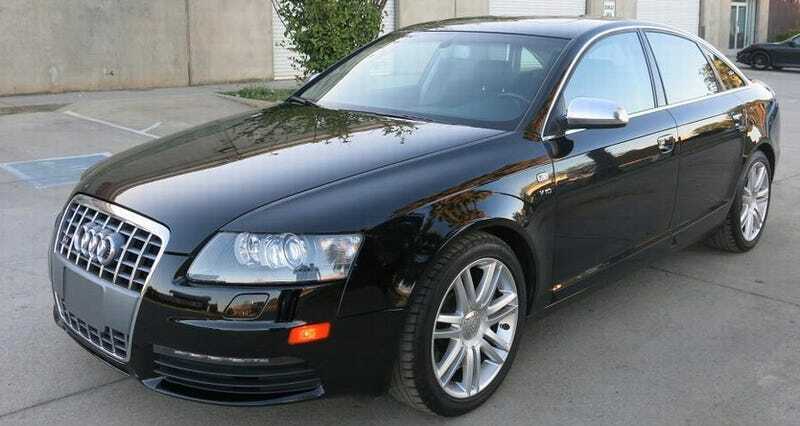 That’s just the case with this 2008 S6 V10. That engine, which sticks out over the front axle line like a Cyrano de Bergerac schnoz, is bigger than in the Gallardo of the same year, featuring both a larger bore and a longer stroke conspiring for 5,204-ccs. The DOHC, 40-valve ten makes it work to the tune of 429-bhp and 398 ft lbs of torque in its Audi guise. That’s channelled through ZF six-speed Tiptronic gearbox, and of course Quattro AWD. This one, in black over black comes with only 88,000 miles on the clock, is said to be fully-loaded (which these bad boys tended to be), looks to be in excellent shape, and... has a salvage title. Yeah, I’ll bet you didn’t see that last one coming. Why the salvage title? Well, the eBay ad doesn’t go into detail, but there’s this older auction for the VIN that says it had frame damage. That ad also notes that retail on the car is $29,508, while the repair cost is estimated to be $20,593. At that time it had 88,658 miles, and it now sports 88,713. It also has a $15,900 Buy It Now, which is way under what these cars usually go for. Of course,that’s owed to the salvage title, the question as to whether the frame damage has been effectively repaired, and the fact that it’s currently not registered. That’s a lot of dice to roll, and makes you wonder if this California car might still be too dear even at its discounted price. That’s of course what we’re about to find out. What’s your take on this sullied sedan? Is $15,900 a fair price for a salvaged S6? Or, is this a case of adios Audi? eBay out of Rancho Cordova, CA, or go here if the ad disappears. H/T to Joseph M for the hookup!